A man was arrested for throwing two tomatoes at former Republican VP candidate Sarah Palin Monday in Minnesota. 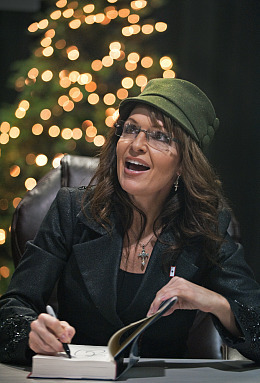 The flying fruit did not hit Palin, who was promoting her memoir, "Going Rogue," at the Mall of America in Bloomington, Minn.
A tomato hit two police officers standing guard over the former Alaska governor. Jeremy Paul Olson, 33, was arrested on suspicion of assault and disorderly conduct. Palin did not comment to Politico.com on the incident. After dodging tomatoes, she attended a private fundraiser for Minnesota Republicans.